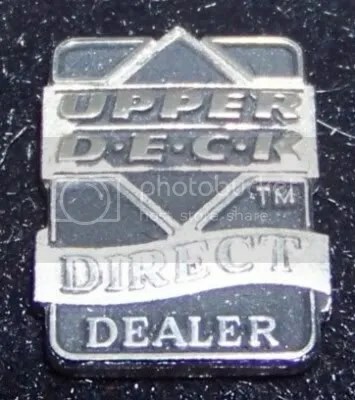 This pin is made of sterling silver, and was a promotional item to dealers who bought directly from Upper Deck in the early 90’s. You don’t see very many of them, but they aren’t that expensive. Right now one is up for sale and it doesn’t have any bids. Investigators found an “assembly line” for fraud when they raided the Lower Allen Twp. warehouse of collectibles dealer Roger Hooper, a Cumberland County detective said Wednesday. Hooper had a machine for resealing vintage packs of sports cards, which have more value if they’ve never been opened, Detective Earl Bock said. Thousands of loose cards and piles of stale chewing gum were in plain view, he said. It was obvious that Hooper was compiling his own packs and passing them off as unopened originals, Bock said during Hooper’s preliminary hearing before District Judge Charles Clement Jr. on fraud charges. Hooper said he never tampered with collectibles or knowingly sold a forgery. “To my knowledge, everything was legit, 100 percent legit,” he said. His lawyer, Corky Goldstein, insisted the criminal charges aren’t warranted and that the allegations should be dealt with in a civil lawsuit. But Clement ordered Hooper to be tried in county court on counts of engaging in fraudulent business practices, theft by deception and dealing in proceeds of illegal activity. The charges stem from Hooper’s dealings with a Virginia sports memorabilia collector and with a Carlisle man who helped Hooper sell items on eBay. “Reams and reams” of complaints from other of Hooper’s customers poured in after a July article in The Patriot-News outlined his legal troubles, Senior Assistant District Attorney Daniel Sodus said. David Herrell of Harrisonburg, Va., said that Hooper conned him out of approximately $5,000 during a 2006 auction by selling him fake autographed items and packs of supposedly virgin football cards that had actually been opened. Expert appraisers verified the frauds, Herrell said. He said Hooper was “rude and dismissive” when he complained. “He told me to put it on eBay and sell it as is,” Herrell said. “How do we know that you didn’t open the packs?” Goldstein asked. Goldstein said an earlier probe of Herrell’s claims by the state auctioneer licensing agency didn’t prompt any penalties against Hooper. Ned Kerstetter of Carlisle said he allowed Hooper to sell items through Kerstetter’s eBay account. Kerstetter said he received a flood of complaints that the items, including packs of coins and sports card packs, weren’t as advertised. Hooper wouldn’t satisfy many customers, Kerstetter said, so he drained his own savings and retirement accounts and borrowed money to give $50,000 in refunds. He said he sued Hooper three years ago and that suit, which prompted the criminal probe, is pending. Hooper testified that he did sell on eBay in 2000 or 2001, but said that his account was shut down without explanation. The machine that Bock claimed was used to make bogus sports card packs was actually for sealing items in plastic for shipment, he said. 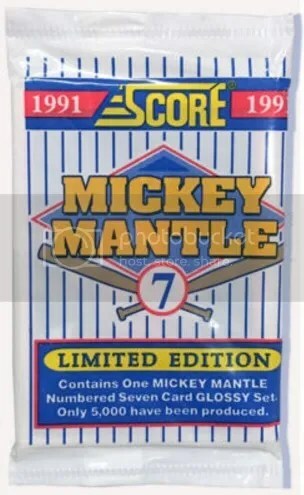 He said the piles of sports cards, chewing gum and wax sealing material the detective saw were from card packs that had been damaged by rodents or the elements. Hooper said he usually sells items “as is,” gives potential buyers time to examine them and offers refunds if complaints are made promptly, which wasn’t the case with Herrell and some customers who complained to Kerstetter. “Did you misrepresent anything that was sold?” Goldstein asked. Fraud is an inherent risk with collectibles, Hooper said, and even he gets scammed sometimes. “When you’re in this type of business, it comes with the territory,” he said.